TUCSON, Ariz. — After so many years of trying to beat the Arizona Wildcats, Lorenzo Romar has joined them. This weekend he will hit the recruiting trail in his new job as associate head coach on Sean Miller’s staff. 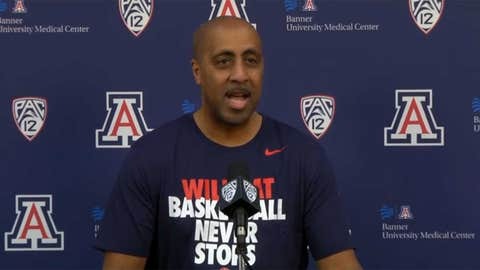 Romar, wearing a T-shirt that read “Wildcat Basketball Never Stops,” spoke with reporters Thursday about why he took the job after two decades as a college head coach, the last 15 years at Washington before he was fired a month ago. “The mission he laid out for me was something that was very, very appealing,” Romar said. Romar first came to Tucson as a Washington player and he’s long been impressed with the basketball atmosphere here. Romar said he arrived in Tucson on Monday but already sees the way Miller’s program operates, saying everything is “very organized.” He’s done some recruiting with Miller and watched film. He said he won’t change his style as a recruiter. Romar, 58, said he wants to be a head coach again, but won’t be looking for anything soon. And he doesn’t think he will have any problem reverting to an assistant’s role, something he hasn’t done since his long-ago days on the staff of Jim Harrick at UCLA.